On our walk this evening I spotted a dark bird with a pale belly darting about the crown of a tree. 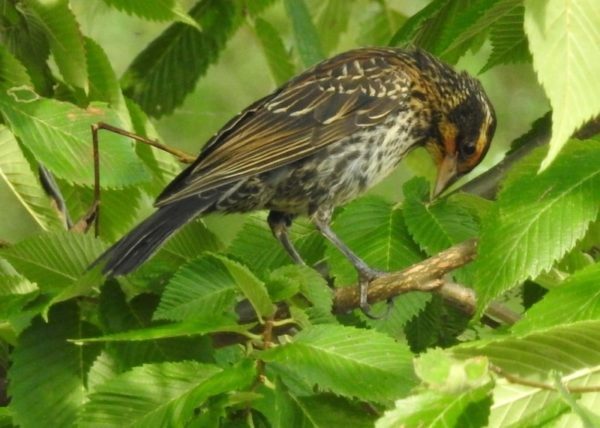 It would perch on a branch, chase another bird away, perch on a branch, fly off to grab an insect, and then repeat the cycle. It was starting to get dark and the tree was 25 yards off or so, so I couldn’t tell whether it was an eastern kingbird (which has a dark gray back and wings and white belly) or a cliff swallow (green and brown head, back, and wings with a pale yellowish belly)—though I never see cliff swallows perch on trees or fly for such short distances, so I leaned toward the former. Once I got closer, it turned out to indeed be an eastern kingbird. 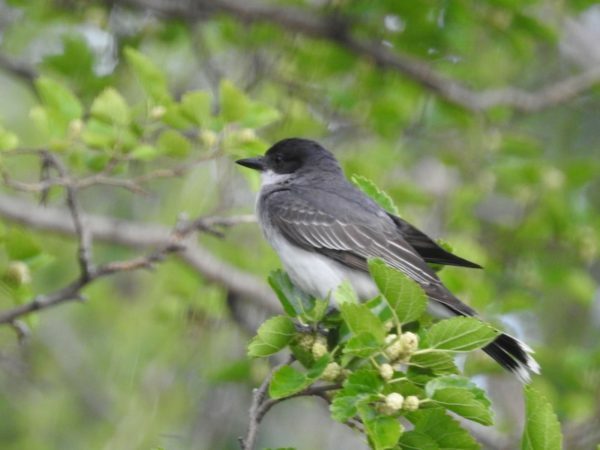 My guidebooks tell me that eastern kingbirds are birds of open field and prairies, but here in the city I only see them near open bodies of water. 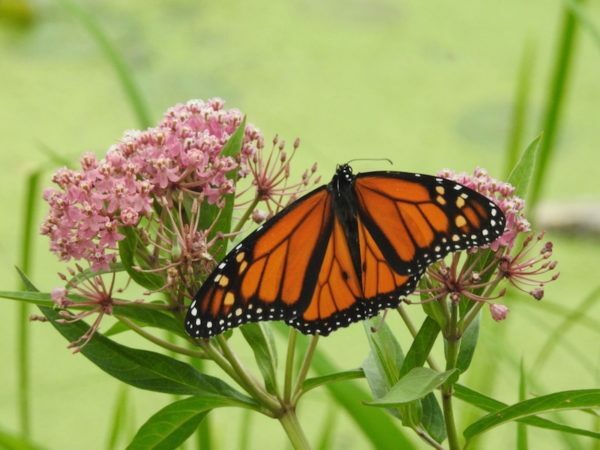 Maybe that’s because they can’t find prairies in the middle of the city, so lakes and ponds are second best. I only started noticing these birds last year. They’re only around in the summer (they migrate to the southern hemisphere for our winters), don’t come to feeders or hang out in residential neighborhoods (at least not in my experience), and they tend to perch in higher branches, so usually you need to be looking up to see one. I look up a lot more often than I used to now that I know what cool birds might be lurking above. 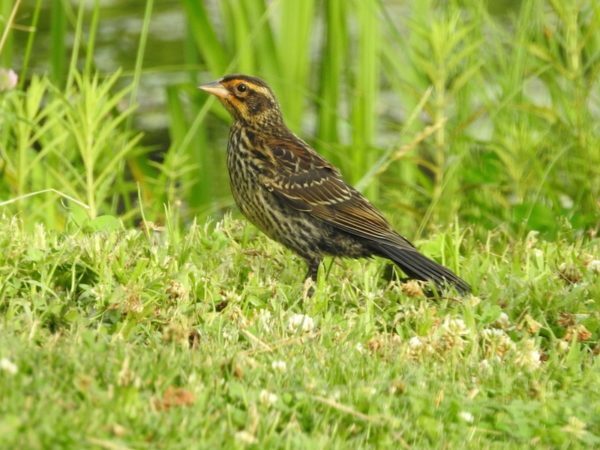 I’m not sure whether this is an adult female (only adult males have the coloring described by the name “red-winged blackbird”) or a juvenile. The”eyebrow” on the adult female is usually white or pale orange, but here the eyebrow, as well as the stripe under the eye, looked a lot brighter than what I’ve seen before, with red toward the beak, transitioning to yellow toward the back of the head. The feathers also seemed more gold-edged than typical. So, is this particular blackbird more colorful than typical, or was it a trick of light made by the setting sun? 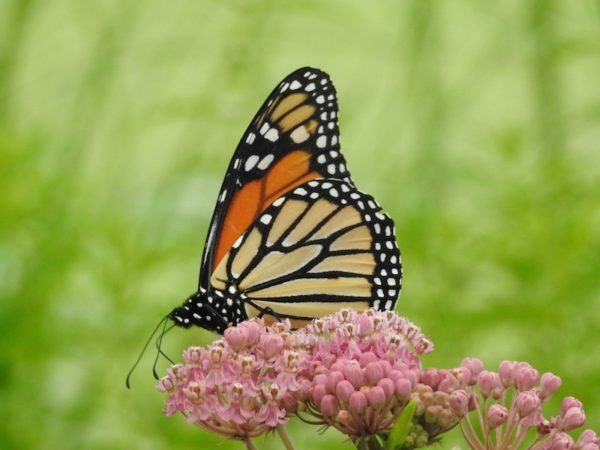 Monarch butterfly drinking the nectar of swamp milkweed. 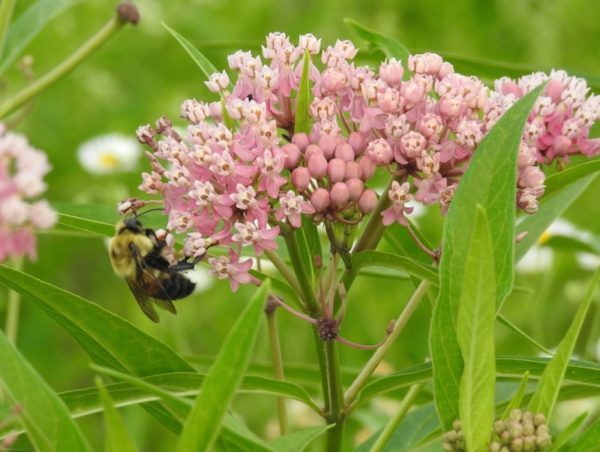 Bumblebee collecting pollen from swamp milkweed.